There are a couple of things that pop into my head immediately when I think of the Garnier brand. First is the hair ad with Davina McCall. (I know she’s one of those people you either love or hate but I have to admit to having a bit of a soft spot for her as I worked with her briefly when she was young and she was one of the kindest and funniest people I’ve ever worked with}. And the second is the Micellar Water which I think is probably one of the best known on the high street. But now they’ve brought out their Pure Active skin care range and I’ve been trialling the Pure Active Sensitive regime. Well, to be honest I haven’t been trialling it at all. This regime was created for sensitive blemish prone skin and so I asked one of my work colleagues if she would like to try it out for me. She most often uses high-end products but was intrigued to see what the Pure Active regime could do for her complexion. I asked her to test the three products over a 28 day period but she noticed an improvement within a week – with all but one blemish clearing up completely in that time. She used the products night and morning starting with the Garnier PureActive Sensitive Anti-Blemish Gel Wash. The gel wash combines effectiveness against blemishes with a gentle formula. Ingredients include zinc, to purify without drying out skin, and witch hazel to soothe and refresh. The formula is hypoallergenic and pH neutral. This isn’t suitable for the eye area though so you’ll need a separate product to remove eye make up. The Garnier PureActive Sensitive Anti-Blemish Tonic is also formulated for sensitive skin with imperfections and has a hydrating formula that’s enriched with salicylic acid to tone and tighten pores without drying. It also contains witch hazel and has a gel like texture. Application should focus on the t-zone and areas with excess sebum. Again this isn’t suitable for the eye area. 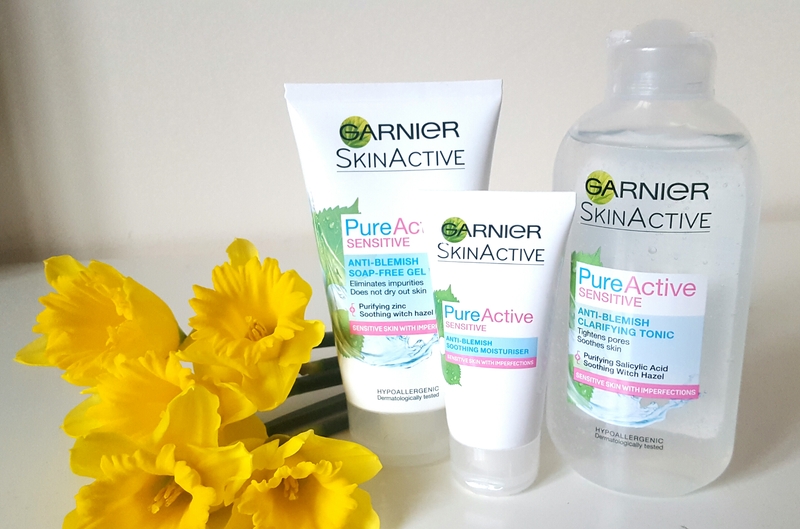 The third product in this regime is the Garnier PureActive Sensitive Soothing Moisturiser. This has a gentle moisturising formula enriched with zinc to help reduce spots and marks without drying out the skin, witch hazel, and glycerin to provide hydration for 24 hours. It’s not greasy or sticky. So this is a regime that really delivers what it promises and the total cost for all three products is less than £17. That’s less than the cost of one product from my work mate’s usual brand. She was so pleased with it that she continued using it past the set trial period and will definitely repurchase. Oh and her boyfriend joined in with using the gel wash too! This post contains PR samples and affiliate links. That tonic sounds soooo lovely! I absolutely love witch hazel!